The decision to lift the tracks along Prospekt Mira from Rizhskiy Vokzal to VDNKh was rather unexpected. 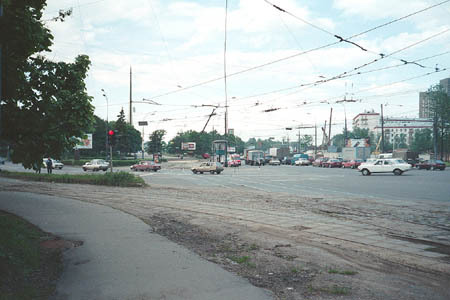 Initially, service on this line was ceased with the estimated term of two years in November 1995 due to Krestovskiy overpass reconstruction, where it was really necessary to use former dedicated tramway rows to pass large car traffic. The reconstruction was begun, a short section of tracks was paved over, but the overhead was left intact. The routes ##5 and 7 that used this line were rerouted (#5 became almost a complete copy of route 17, and route 7 was shortened to Kalanchyovskaya Ulitsa loop). 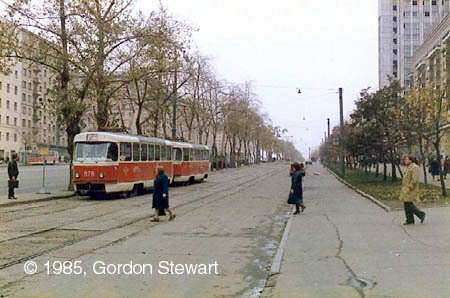 Two years later, in 1997, tram depot named after Bauman began preparations for resuming service on both routes (it must be noted that route 5 was one of the busiest routes of Moscow tram with daily patronage of around 100 000!) Suddenly, the city administration has made a mind that the 'provisional' closure must become permanent. One of the reasons was this: 'The line has been out of service for a long time but nobody complains'. I shall not comment this statement. The complete line was lifted in 1998-1999. 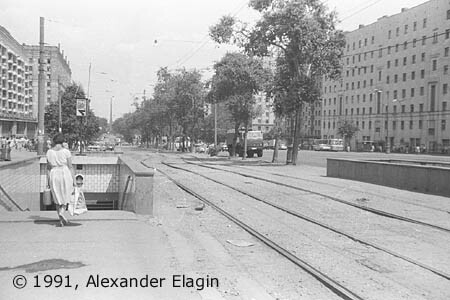 This photo of 1991 shows the tracks along Prospekt Mira at Alexeevskaya metro station and the trees (green, of course, but the amateur picture is black-and-white...) still lining the road. The same place eight years later. The tracks were removed, but what for - nobody knows. The space is used today mostly as a parking lot while the width of the road was not increased after the reconstruction. Note that trees are mostly gone. 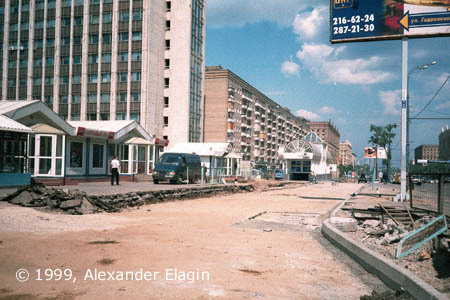 Staroalexeevskaya Ulitsa tramstop was the next one en route to the north. To make things more clear note the buildings to the right (they are on the left side on the previous images). And another stop, now Malomoskovskaya Ulitsa, again lookig south. 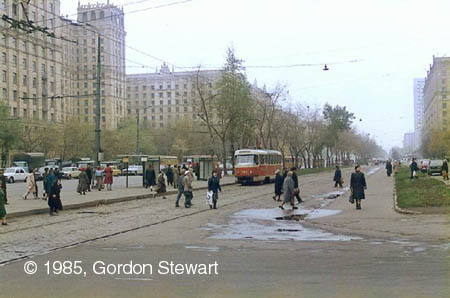 A triangle junction of lines in the crossing of Zvyozdniy Boulevard with Prospekt Mira, not far from Kosmos cinema. The line to Ostankino branched to the left, while the trunk line along Prospekt Mira lead to VDNKh and even farther to the north. Today it is impossible to take a photo from this spot, and the landscape has drastically changed. Not to mention that all tracks have been lifted here.